The other day I was scouting for morels and early orchids in a patch of Elms. 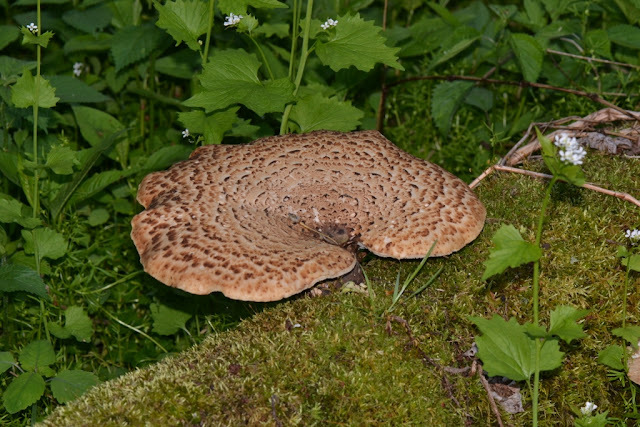 I didn't see any morels but I did see another kind of (reportedly) edible mushrooms. 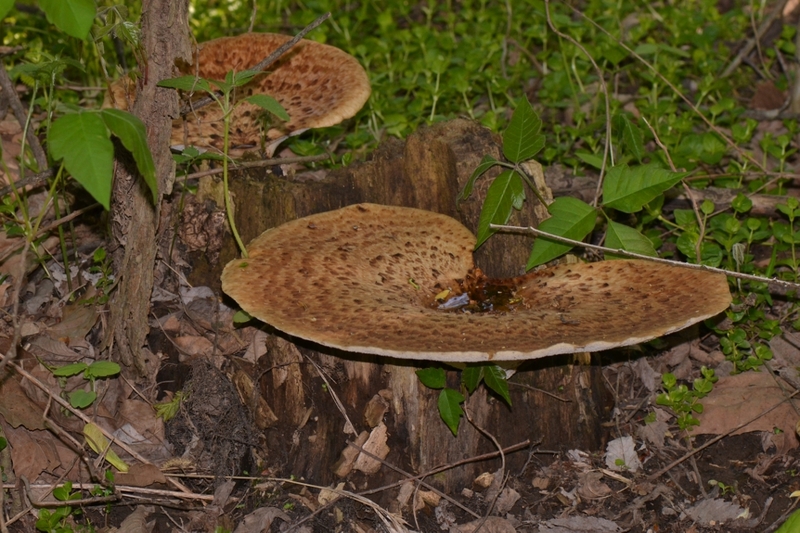 I watched some slugs happily devouring the scaly tops of these large, saddle-shaped mushrooms. Here is a photo of these mushrooms. 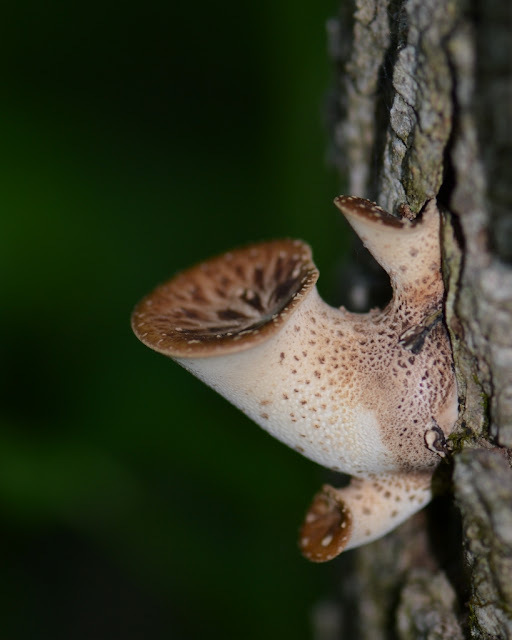 They are called Dryad Saddles (Polyporus squamosus). Some folks call them Grouse Wings. Since Dryad Saddles like to grow on Elms, they were plentiful... I was in a large patch of elm trees. I could have gathered some of these mushrooms for eating, but I didn't think we would enjoy their smell or flavor. 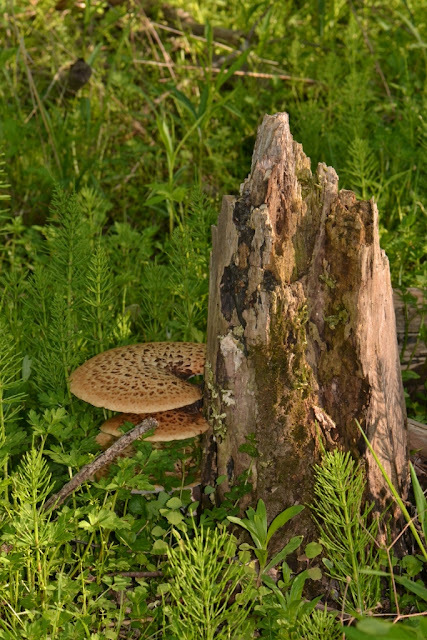 Bill Russell, in his book, Field Guide to the Wild Mushrooms of Pennsylvania And the Mid-atlantic , says, "Some people think the mushroom smells like cucumber or watermelon." He also says, "Someone with a powerful imagination long ago thought that they would make good riding saddles for fairies and such creatures." Here is a photo of a Dryad Saddle growing out of a moss-covered fallen log. 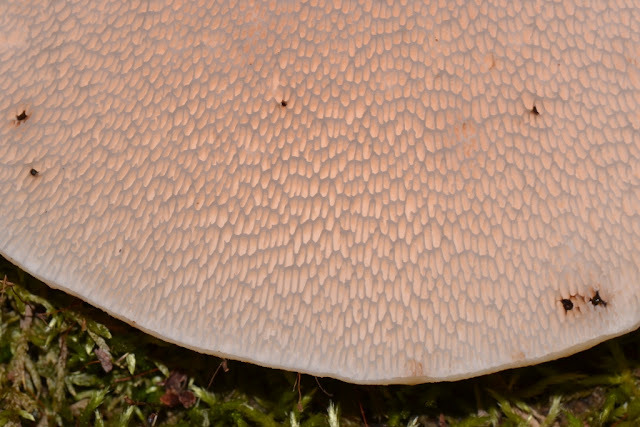 The underside of the cap of Dryad saddles (Polyporus squamosus) is all pores. 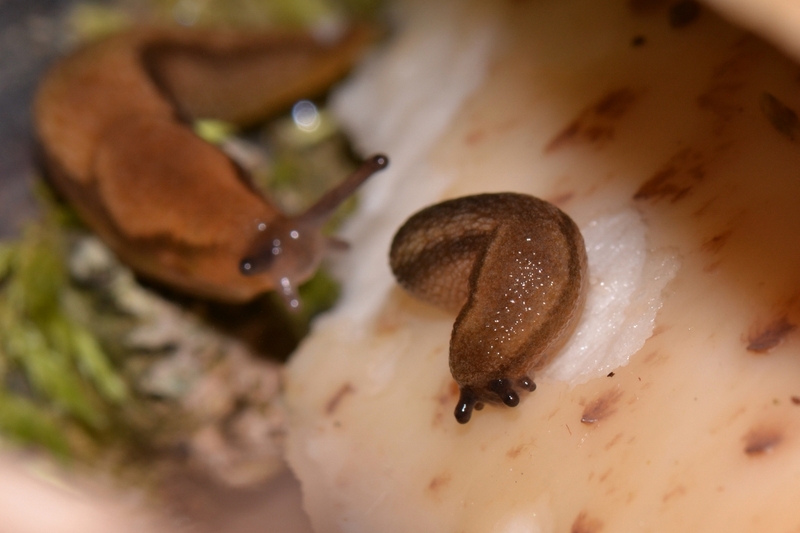 I took some photos of the slugs feeding on the mushrooms. Large or small, the slugs seem to have a good life with all these large mushrooms fruiting right now. 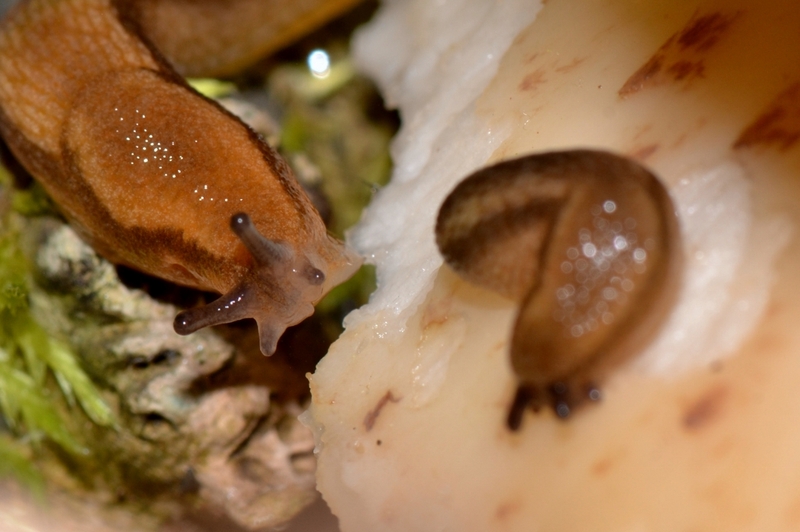 In the next photo the slug has "slimed" it way up a plant stem and is stretching over to "nibble" on the edge of a Dryad Saddle. 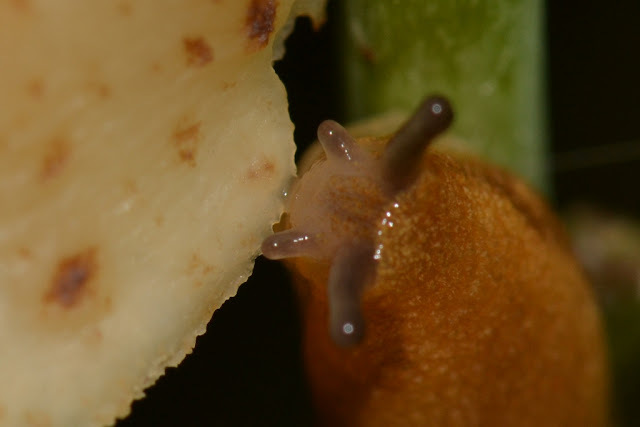 That is, if a slug can "nibble" with its radula. Not all of the fruiting bodies were mature. I saw some very young Dryad Saddles. I guess that means the slugs can feast for a little while longer before they have to nibble on some other fungi. They sound yummy. I haven't seen them around here, and am not confident enough about mushroom identification to ever pick and eat 'em. Morels are very tasty. Other than morels, I am like you and rarely risk eating wild mushrooms.